ingredients: Dirty Martini, True Grenadine, Simple Syrup, and Clarified Lime Juice. The line extension will be introduced at the 2014 Winter Fancy Food Show in San Francisco. The new Bar Ingredients are gluten-free, all natural and crafted in small batches out of Powell & Mahoney’s plant in Vermont. 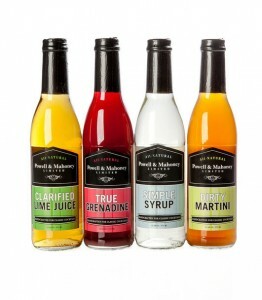 The 375ml bottles will retail at $4.99 – $5.99 per bottle, thereby allowing at-home consumers to craft restaurant quality cocktails at a fraction of the bar or restaurant price. Tad Carducci, who has played a major role in the recipe development in many Powell & Mahoney, Ltd. mixers, was the architect and “the palette” behind the development of the Powell & Mahoney, Ltd Bar Ingredients. Tad set forth to create truly pure, unique and unparalleled cocktail ingredients and, once again, he hit the bull’s-eye! Powell & Mahoney, Ltd. Bar Ingredients were launched in early December, and are now available for ordering at powellandmahoney.com. 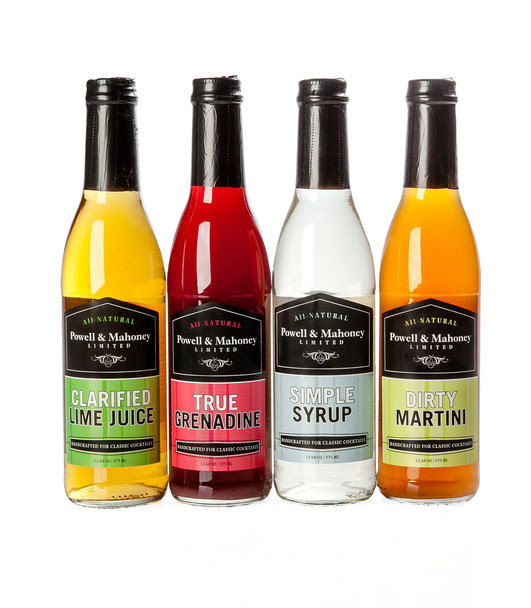 The ingredients will soon be available at finer gourmet, grocery and natural foods stores, as well as – in many states where finer wines, spirits and beers are sold. About Powell & Mahoney, Ltd.